Our school Mission Statement set outs the fundamental principles which underpins everything that we do at St. Joseph's. Our faith and belief guides us to reach our full potential. We at St. Joseph’s ensure our children receive a firm foundation to their faith. Our mission statement is displayed throughout the school. This makes sure that everyone who comes into our school knows that our faith is very important to us here at St. Joseph's. We have daily acts of collective worship, sessions of Catholic meditation which we call Silent Listening, assemblies, hymn practices and celebrations of mass. Prayer is a central part of our school day. We pray in our classrooms four times a day. We also share circle time during which the children learn about that week’s Statement to Live By, which links to our R.E. curriculum. 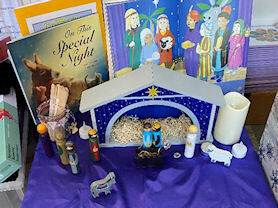 Every classroom has a dedicated prayer area which includes words from Scripture, Liturgical images, artefacts and prayers. 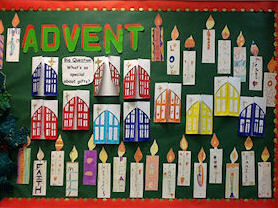 The children also design and carry out their own acts of collective worship within their class twice a week. 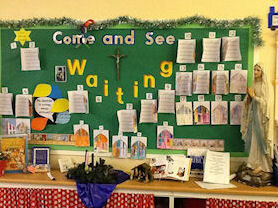 Using the 'Come and See' programme, we teach RE through three processes, Search, Revelation and Response. It follows the pattern of: The human search for meaning, God’s initiative in revelation and the response in faith. Each class studies a different topic specific to their year group. However, the theme of the topics remains the same across the year groups. These topics/themes are also developed through different 'understandings' each term. The three autumn topics are developed in the light of an understanding of Creation. The three spring topics are developed in the light of an understanding of Incarnation. The three summer topics are developed in the light of an understanding of Redemption - the work of the Holy Spirit. Two other faiths are taught every year following the programme of study in 'Come and See'. One week teaching and learning time per year is given to each religion taught.